On an EN-GB keyboard (and maybe others) ALT+PrtSc is the default keyboard shortcut for "Take a screenshot of a window" as configured in System -> Preferences -> Keyboard Shortcuts. However the system doesn't seem to respond to that keyboard combination at all. Pressing ALT+PrtSc on a default Maverick install does nothing. Indeed attempting to _set_ that keyboard shortcut in the Keyboard Shortcuts dialog results in it not being registered. 2) Try to take a screenshot of one active window with ALT+PrtSc - nothing happens. Seems a fairly critical regression bug given we document this keyboard shortcut in the help, and it's very commonly used by documenters and people getting support. It works fine in previous releases. Looks related to bug 198748 as in a terminal if I do ALT+PrtSc+H I get the magic SysRq key help, so it looks like the kernel is trapping ALT+PrtSc. I can then subsequently use ALT+PrtSc (although in GNOME it shows as ALT+SysRq rather than ALT+Print Screen as expected). Seems to be a kernel bug rather than X as first envisaged. reproduced here, works find in Lucid, no response to alt+prtscr in Maverick. Prtscr on it's own works as expected. 1) Disable SysRq handling by default. This is a simple 1 line change by adding "kernel.sysrq = 0" to /etc/sysctl.conf . Those then wanting to enable SysRq handling can do so by either "echo 1 > /proc/sys/kernel/sysrq" or "sysctl -w kernel.sysrq=1"
2) Reassign the keyboard shortcut to capture a screenshot of the currently active window to something other than Alt+PrintScreen, eg. use Ctrl+PrintScreen or something. 3) Regress expected kernel behavior to not interpret Alt+PrintScreen as SysRq when SysRq handling is enabled. I personally don't feel this is the correct solution. I think option 1 seems to be the most reasonable solution. This is not a kernel bug at all. Alt+PrintScreen has a pre-existing meaning, which is "SysRq", as printed on the keycaps of nearly all PC keyboards. SysRq is not an appropriate keybinding for taking screenshots of a window. This is a bug in the keymaps, not in the kernel. > /proc/sys/kernel/sysrq" or "sysctl -w kernel.sysrq=1"
This has the result that the screenshotting behavior on the desktop varies according to whether Magic SysRq is enabled or not in the kernel. That's not appropriate either. GNOME needs to just pick a default keybinding that hasn't already been spoken for by the kernel for the past 15 years. Reassigning this to gnome-settings-daemon, which is responsible for this shortcut. If we disabled SysRq, will we still be able to Alt+SysRq+K ? If not, option 2 seems better..
How was Alt+PrtSc possible earlier? What seems to have changed now? "Under graphical environments (such as Gnome or KDE) 'Alt'+'PrintScrn/SysRq'+key combination generally only leads to a screenshot to be dumped. To avoid this Print Screen feature the magic SysRq combination should be additionally prefixed by Ctrl, becoming 'Ctrl'+'Alt'+'SysRq'+key. " this is clearly a regression. we use alt+printscreen for ages ... in lucid it worked. Did anyone find out what was changed this cycle to cause this regression? marking RC as noone could tell me in -desktop and -devel that this was an explicitly decided change somewhere. IMO, if we cannot find out why this happened, we should let sysrq regress in kernel default settings until we find the right fix, rather than a long standing default UI binding. Is this metacity specific? I'm on compiz, using an en_US keyboard layout, and the printscreen key has behaved the same as it used to do in the last 15 years or so: PrintScr does a screenshot, and Alt+PrintScr is SysRq, just as printed on the key. @Martin, tried under Lucid? ALT+PrScr used to snapshot a window. > @Martin, tried under Lucid? ALT+PrScr used to snapshot a window. not using that (only en-US and de-nodeadkeys). If Alt+PrintScreen triggers a screenshot, that's indeed a bug. 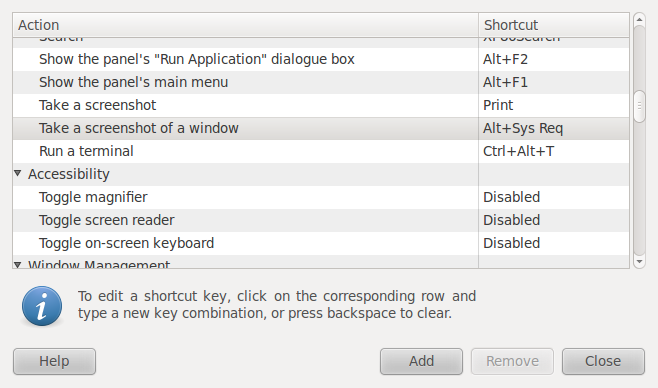 I'm using an de_DE keyboard and till 10.04 Alt+PrtSc, a screenshot of the active windows was taken, as specified in the keyboard settings and as default behavior for many Linux Distributions and even Windows. The SysRq is only useful, if you press an additional key. And SysRq was working too in Ubuntu <10.10. It's always been the case, on both GNOME and Windows that ALT+PrtScrn takes a screenshot of the active Window. This is a really bad regression from a user experience POV, especially for non-technical users that take screenshots of active windows to send when they have issues. If we are now saying that ALT+PrntScrn *shouldn't* take a screenshot of the active window then we should at least have an alternative key binding sorted out and have it really well documented by release, otherwise revert whatever change caused this until Natty. I've been training users for about five years that alt-printscreen takes that picture they need to attach for there bug report. Alt-PrintScreen has previously worked for the current window + more recently, since bug #74008 was resolved. It's also worth noting that according to http://en.wikipedia.org/wiki/Print_screen it's also the behaviour in KDE. Is Kubuntu showing the same problem? We just asked a KDE user on irc to test and ALT+PrScr does _not_ take a screenshot for him (running Lucid with backported KDE packages). Indeed in the keyboard configuration screen on Kubuntu it refused to accept ALT+PrScr as a valid keypress. "The key you just pressed is not supported by Qt"
If alt+prscr is really rendering a sysrq event, it would appear that sysrq is not a bindable event. I can't get it to show up in anything (including xev). While I can see the technical argument for making alt trigger the alternate key, the solution in the latest kernel is at least 10 years too late. There is too much documentation and too much "known behaviour" to try (or want) to reverse things now without upsetting everybody who expects a windowshot from an alt+prscr combo. It's also well known that if you want sysrq, you use control+alt+prscr. I assume this key-combo is also broken now (or it renders as control+sysrq). Everything about this stinks to me and I think we should fight upstream all the way on this, disabling the new kernel configuration by default. > It's also well known that if you want sysrq, you use control+alt+prscr. Where is that documented? It's at least news to me. > all the way on this, disabling the new kernel configuration by default. going on here. Thanks in advance! I'm using a USA keyboard layout and Alt+PrScr does indeed take a screenshot for me in Lucid. But same USA layout, in Maverick I can *not* do a Alt+PrtSc , but can Alt+SysRq+K. If i change the shortcut from Keyboard Shortcuts, i can not even again set it to Alt+Print , but i can set to every other combo. > Do you have proof (or a patch) which would actually identify this as a kernel change? The only proof I had was anecdotal: I started using 2.6.35 on Lucid long before upgrading to Maverick. Alt-PrintScreen was broken back then, before any of Maverick's X changes were near my system. But if the patch by Dmitry Torokhov is the cause of this behavioural change (which it does look like it could be - it's making sysrq bypass evdev), we need to nail down the rationale (if it was intended) or blindly counter the patch... I can't see there being enough time to send this upstream, get a fix and get it back through trunk into maverick before release. > Where is that documented? It's at least news to me. From my POV the patch should be reverted, cause you can bypass evdev after emitting Ctrl+Alt+SysRq+R. Also, Alt+SysRq under X is taking screenshots since I use Linux (~11years). I don't see any need for this patch. And I don't see, why Ubuntu should work another way than all other distros at SysRq. Also there seems to be a general problem with SysRq. 'cat /proc/sys/kernel/sysrq' returns 0 on my installation and that should deactivate SysRq's at all, but it don't. Could this be a sideeffect of the patch? and SysRq doesn't produce an evdev event, as intended by this patch. > and get it back through trunk into maverick before release. Now the release is out, any chance this can be looked at for a 10.10 SRU? I'm only a user and from a user point of view I must say: "If it's not broken don't try to fix it". I believe I speak for many users who are used to do Alt+PrtScn to capture for ever. Even if this is right, don't try to re-educate the entire pc user population as this will result in general frustration and disappointment. For the issue itself, I've used xev and found that on my pc the PrtScn button produces an Insert button press event. I changed the keybinding event from "<Alt>Print" into "<Alt>Insert" and now I can do screen-shots using the Alt+PrtScn buton combination again, but I would like to see that everything is back as it used to be. I can confirm that alt+print doesn't work on my up to date ubuntu 10.10 amd64. This needs to be fixed soon or many user will get annoyed! Is this (sudo sysctl -w kernel.sysrq=0) a permanent thing or should I do it every time I boot? @AmiG: You need to do it after every reboot or add it to /etc/sysctl.conf. I'm currently using a Spanish keyboard layout, and up until Lucid I could both take a screenshot with Alt+PrtScn and use magic SysRq keys without additional modifier keys (so e.g. Alt+PrtScn+B rebooted the system). Now I'm experiencing this bug. There is no reason to change the old behaviour. If Alt+PrtScn is pressed and then released, obviously no SysRq event was intended and a screenshot should be captured. On the other hand, if Alt+PrtScn+(another key) is pressed, then it should be interpreted as SysRq. Also, this happens on Compiz too, so it's not Metacity-exclusive. Just tried and reproduced this bug on my laptop too. Problem is, on my laptop's keyboard, PrtScn and SysRq are on different physical keys. So the automatic interpretation of Alt+PrtScn as a SysRq event is not only counter-intuitive, it's plain wrong. Fibonacci, what model laptop do you have? The issue is more in kernel preempting the call than in any window manager. It should be marked as invalid on Metacity too, then. Added a kernel task to the bug. @Fibonacci It has nothing to do with the window manager (metacity, compiz, whatever) because it's the kernel. It's blocking the sysrq key permeating to the rest of the system. You can prove this very easily in xev. @Oli Actually it's blocking Alt+PrtScn. As I stated before, SysRq is on a different physical key on my laptop, yet Alt+PrtScn is blocked. clean Ubutun 10.10 + latests updates. Me too. Print Screen works, Alt+Print Screen/SysRq does not. Ubuntu 10.10. That would break well-known user experience. Users are used to press PrintScreen/Alt+PrintScreen on all platforms (even Windows). Yes, separate keybindings for direct copying to clipboard would be very handy. Why not grabbing Alt+PrtScn when it is pressed alone, but allowing it to pass through to the kernel as a SysRq event when it is pressed together with another key and ONLY IF SysRq is actually on the PrtScn key? I just checked the latest Natty 11.04 daily: both Alt+PrtScn and Alt+PrtScn+REISUB work again as expected. @Fibonacci: I don't have a separate SysReq key. If it still does nothing in Natty and you want to change that, I'd propose to open a new bug report, as this one is about the broken Alt+PrtScn in Maverick. tonnzor is absolutely correct in post #53 ... personally I have used Alt+PrtScrn for a windowshot thousands of times on all releases of Windows and an older Ubuntu Linux as well as Linux Mint 8 and 9 (it is 'broken' on Mint 10). I have never used SysRq in my many years of computing and so I don't really care (personally) what happens to it. Alt+PrtScrn for a windowshot is indeed a "well known user experience". Please don't leave it broken. @Oliver: Alt+SysRq works as expected on my laptop. It's just that Alt+PrtScn duplicates that function. On some keyboards RightAlt is labeled as "Alt Gr". and I think that's wrong. snapshot of the active window. RightAlt+PrtScr take snapshot the active window. > On some keyboards RightAlt is labeled as "Alt Gr". > and I think that's wrong. > dialog results in it not being registered. > 2) Try to take a screenshot of one active window with ALT+PrtSc - nothing happens. > people getting support. It works fine in previous releases. Do you have laptop or desktop? Fn+PrtScrn/SysRq combination to get SysRq event. and SysRq event for Fn+PrtScrn/SysRq. I have always used left Alt for both screenshots and SysRq events. There's never been a problem in my system because of that. > Do you have laptop or desktop? Not broken for me anymore. I'm in 11.04, fresh install. It works for me again after installing 11.04. But I did a complet new install, not an upgrade, cause that messed up two of my systems. Maybe it's different when just doing an upgrade from >11.04. Well, I can set Alt+PrtScn as a shortcut, but it's interpreted as Alt+SysRq. Don't know what impact would that have on Magic SysRq Keys. I have just done an install of 10.10 64 bit then an upgrade to 11.04, alt+prtscr now works as expected and takes a screenshot of the current window. Why is this Invalid, it doesn't make sense because it's reproducible.. and affects thousands of people.. This is not a new regression for Oneiric and is therefore not suitable for inclusion in the release notes. The prior release notes have shipped, and therefore marking task as Invalid. Is this bug still propagating to new versions, or has it been fixed? > shipped, and therefore marking task as Invalid. Florian Sievers (#31) is right: in a clean Maverick install, 'cat /proc/sys/kernel/sysrq' (or 'sudo sysctl -a | grep kernel.sysrq') shows kernel.sysrq=0 , but in fact sysrq's are enabled (and eating up Alt+PrtScn). If i set it as 'sudo sysctl -w kernel.sysrq=0', supposedly it wouldn't change anything, since its already 0, but yet it disables sysrqs and allows me to take windowshots again. So currently this is really a mess. If this is fixed for Natty, Oneric, great. But for Maverick it is not, so please at least issue an SRU to fix that! It is *very* annoying, and newcomers and novice users will find this *very* frustrating, to say the least. In Lucid, both worlds were happy: Alt+PrnScr alone took windowshots, and Alt+PrnScr+<somekey> triggered Sysrqs. Maverick *should* have the same behaviour. Also, as spoken here several times: this is expected even from Windows users. Sysrq's can also be triggered with Right Alt (AltGr here) + PrnScr. Taking windowshots is *far* more common then Sysrqs (meant for emergencies only). Those who know what a sysrq is can easily workaround this. Most of "screenshoters" (=regular users) can not. Please revert to the expected behavior! Alt-PrtScn does a full-screen screenshot (screenshot is taken when I release Alt). My keyboard settings pane still says that Alt-Print should screenshot a single window. (That's 3 minutes before I started writing this comment.) I haven't done any sudo commands today, but maybe one of the PrtScn key combos did it? Maverick EOL -> Won't Fix. Alan Pope, this bug was reported a while ago and there hasn't been any activity in it recently. We were wondering if this is still an issue? If so, could you please test for this with the latest development release of Ubuntu? ISO images are available from http://cdimage.ubuntu.com/daily-live/current/ .